Welcome to LocalCircles.com. This Agreement derives from the LocalCircles principles, and governs our relationship with users and others who interact with LocalCircles. By using or accessing LocalCircles, you agree to this Agreement. 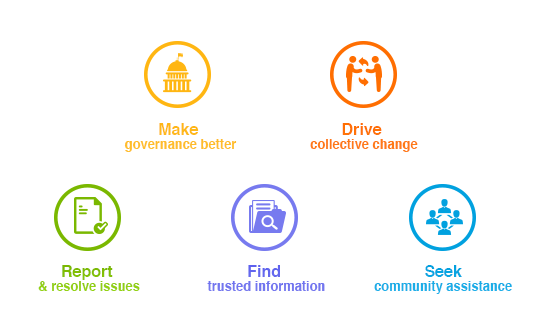 LocalCircles brings citizens together for governance, causes, interests, cities, neighborhoods, school, workplace etc. in an integrated, easy, and secure way. These communities are called Circles at LocalCircles. Community Circles – LocalCircles itself operate or support a large set of circles and these circles are founded, administered or developed and grown by LocalCircles directly or indirectly by inviting a large set of citizens registered with LocalCircles or citizens who have been invited by other citizens. The founder, administrator of these circles are generally appointed by LocalCircles for their thought leadership/area of expertise. In some cases, the founder/administrator roles are given to a partner who can play a role in growing, developing the circle. In cases of partnerships where a specific agreement has been laid out between LocalCircles and the partner, the agreement terms for community circle Founder/Administrator shall prevail. Law & Order Circles – LocalCircles at times partners with Government bodies for building communities. These circles provide the capability for citizens to report anonymously. Identity of member choosing this option is not revealed in the circle. However, to ensure accountability and prevent misuse, the circle Founder and LocalCircles are aware of the posting member’s identity. You can only invite or approve a request from a member that belongs to a Circle based on the criterion above. You would be violating your membership terms if you invite a member that does not belong to that Circle. You are always required to use your real identity (name, photo, relationships, family information, work title, company you work for, house or apartment address, phone number) at LocalCircles. You must not share your account password with anyone else. If you are under thirteen years old you are not permitted to access LocalCircles. We believe that the ratings and reviews for the entities submitted by you are useful for the broader community. So, we reserve the right to share your ratings and reviews with people outside your Circles. When you are using our Emergency Alert feature, we reserve the right to share this information to local city authorities so they can take appropriate action to help you with your emergency. All the activity, including the postings in the resources and the events sections, belongs to the Circle that they were posted to. When you leave a Circle, your activity still remains in that Circle unless you explicitly delete it yourself before leaving the Circle. You may not provide us with any Content you don’t have the right to publish or that is defamatory, explicit, infringing, illegal or otherwise tortious. You certify that by posting any content to this site you are the owner of all rights to the content and agree to hold owners of LocalCircles.com harmless for any legal action arising out of such content. If you believe Content on LocalCircles.com infringes your copyright, you can reach our notification agent at Local Circles Inc., 5255 Stevens Creek Blvd, Suite 276 Santa Clara CA 95051. Email: info@LocalCircles.com. We reserve the right to remove all posts if these posts include include any objectionable content for the Circle members, business or self-promotion (unless authorized specifically as part of circle support/sponsorship program) or you violate this agreement or our other policies, or engage in unacceptable behavior via the website. Note that other members of the circles can mark your content inappropriate, in which case, LocalCircles will remove the content immediately and will send you a warning. If multiple members of a circle mark your content inappropriate, your access to that circle or to all circles might be suspended. Furthermore, LocalCircles reserves the sole right to remove any content for any reason without any recourse by the user of the site. We can cancel or suspend your account or other privileges, or otherwise refuse service to you, if you violate this agreement or our other policies, infringe IP repeatedly, or engage in unacceptable behavior via the website. If other members of circles report you as an inappropriate member, LocalCircles will suspend your access to that circle or all circles. Furthermore, LocalCircles reserves the right to remove any account for any reason at its sole discretion without any recourse by the user. We can cancel or suspend a Circle if members violate this agreement or our other policies, infringe IP repeatedly, or engage in unacceptable behavior via the website. A circle can be suspended and/or deleted if multiple members report the circle as inappropriate. Furthermore, LocalCircles reserves the right to remove any circle for any reason at its sole discretion without any recourse by the users. LocalCircles displays ratings of entities based on open source research, partners, as well as user generated reviews. LocalCircles cannot and does not guarantee the accuracy or the quality of these listings, ratings, and reviews. We also display listings, reviews, and ratings submitted by our users. As noted earlier, we cannot guarantee the accuracy, integrity, and quality or any of these listings, ratings, and reviews and many times these may be due to individual experiences. LocalCircles by no means has any liability for such reviews. In the event your business/organization has an inappropriate rating from a user, you may contact that user. LocalCircles currently does not provide a way for organizations to contact its members and may provide that service at a later date. We allow Circle members to send an alert via SMS in case of urgent and/or emergency situations. Note that even though these SMS messages come from LocalCircles, they are actually sent to you by your Circle members. By signing up at LocalCircles and entering your cell phone number in your profile, you agree to receive these emergency notifications. Who has Viewed Your Profile. The nature of LocalCircles platform is such that it enables people to discover valuable local contacts. In order to help you with that, we display the name of the members who have viewed your profile. By signing up at LocalCircles, you give your consent to this tracking. We may highlight some of your Circle members in our “Members you may want to know” section if they share some commonalities with you. You agree to our software using your home address, work address, interests, family information for connecting you to the other members in your Circles. Be it inviting new members to a community or sharing experiences about local businesses, you can improve the credibility of information available to the communities. To encourage this value addition by all community members, LocalCircles tracks your contributions such as rating and reviewing entities, or adding new entities, growing your community by inviting new members, and creating new active Circles for your communities. We may invite the top community contributors to our stakeholder meetings and engage with them, only if they are willing to do so. By signing up at LocalCircles you provide your consent to this. If you or a family member are associated with an entity or have a vested interest in that entity, you do not have the right to add, rate, or review that entity at LocalCircles. Circle founders are people who create a new Circle. Limited information about the founders is available to members that are not in the Circles of that founder on the Circle search page. Same user terms apply to all founders and if a founder violates the terms, their account may be suspended per these user terms. Circle founders cannot promote themselves or their business/interests in community circles. LocalCircles at all times is the owner of all circles and their content at LocalCircles. Circle founders by agreeing to LocalCircles terms agree to share all content posted by them with LocalCircles. Upon suspension of a founder account or their withdrawal from LocalCircles, LocalCircles reserves the right to appoint a new founder or administrator to maintain circle continuity. Circle administrators are people who administer a circle. Same user terms apply to all administrators and if an administrator violates the terms, their account may be suspended per these user terms. Circle administrators cannot promote themselves or their business/interests in community circles. LocalCircles at all times is the owner of all circles and their content at LocalCircles. Circle administrators by agreeing to LocalCircles terms agree to share all content posted by them with LocalCircles. Upon suspension of an administrator account or administrator privileges account or their withdrawal from LocalCircles, LocalCircles reserves the right to appoint a new administrator to maintain circle continuity. LocalCircles strives to create a global platform for communities with consistent standards for all, but we also have to abide by the local law. You consent to having your personal data reside and processed on our servers located in the data centers worldwide. If compliance to law requires us to share some or all of your data at LocalCircles with Government authorities, you consent to us sharing this data. WE AND OUR SUPPLIERS SHALL NOT BE LIABLE FOR ANY LOST PROFITS OR SPECIAL, INCIDENTAL OR CONSEQUENTIAL DAMAGES (HOWEVER ARISING, INCLUDING NEGLIGENCE) ARISING OUT OF OR IN CONNECTION WITH LOCALCIRCLES.COM, OUR SERVICES OR THIS AGREEMENT. WE AND OUR SUPPLIERS SHALL NOT BE LIABLE TO YOU FOR MORE THAN $100. Some jurisdictions do not allow damages exclusions, so they may not apply to you. This agreement is governed by California law as it applies to agreements entered into and to be performed entirely within California between California residents. Any claim or dispute regarding LocalCircles.com must be resolved exclusively by a federal or state court located in San Francisco, California, except as otherwise agreed by the parties or as described in the next paragraph. You submit to the personal jurisdiction of courts located in San Francisco, California for litigating such claims or disputes. FFor any claim (excluding claims for injunctive or other equitable relief) where the total relief sought is less than $10,000, the party seeking relief may choose binding non-appearance-based arbitration through an established alternative dispute resolution provider mutually agreed upon by the parties. The arbitration must be conducted via only a combination of phone, the Internet and written submissions (the party initiating arbitration may select the specific manner); the arbitration shall not involve personal appearance by the parties or witnesses unless otherwise mutually agreed; and the arbitrator’s judgment may be entered in any court of competent jurisdiction. LOCALCIRCLES.COM AND ITS SERVICES ARE PROVIDED "AS IS". We do not promise that any aspect of the site or our system will work properly or continuously. Some jurisdictions do not allow warranty exclusions, so they may not apply to you. If you have a dispute with another user of LocalCircles, you release us (and our officers, directors, agents, subsidiaries, joint ventures and employees) from claims, demands and damages (actual and consequential) of every kind and nature, known and unknown, arising out of or in any way connected with such disputes. If you are a California resident, you waive California Civil Code §1542, which says: "A general release does not extend to claims which the creditor does not know or suspect to exist in his favor at the time of executing the release, which if known by him must have materially affected his settlement with the debtor." This agreement does not create any agency, partnership, joint venture, employment or franchise relationship. Any unenforceable portion of this agreement shall be enforced to the maximum extent possible, and the remaining portions shall be given full effect. Our failure to act in a particular circumstance does not waive our right to act with respect to that or other circumstances. We shall be excused for any problem due to a circumstance beyond our control. This agreement makes up the entire agreement between the parties regarding LocalCircles, and supersedes any prior agreements. You will not transfer any of your rights or obligations under this agreement to anyone else without our consent. You will comply with all applicable laws when using or accessing LocalCircles. If we make changes to this Membership Agreement, we will notify you by publication on this page. 5255 Stevens Creek Blvd, Suite 276 Santa Clara CA 95051. This agreement was last updated on January 1st, 2017.